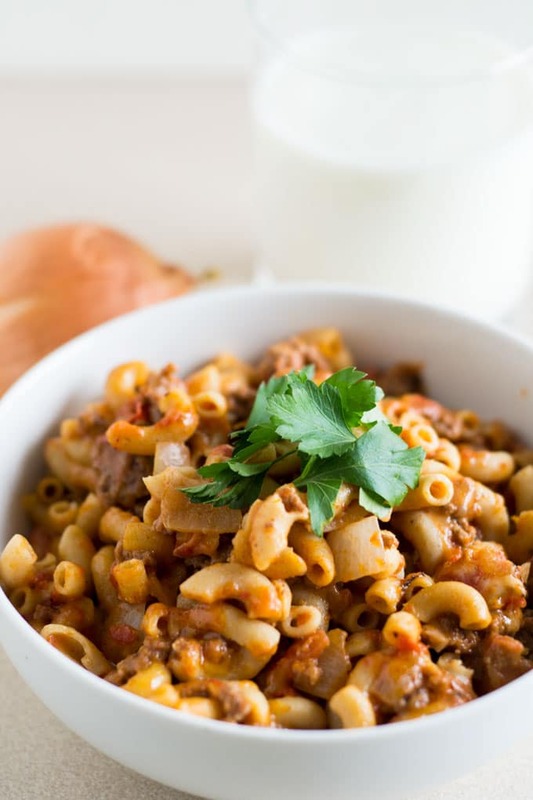 This simple goulash recipe is one of my family’s go-to meals. 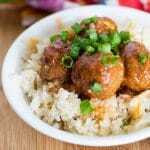 When I’m stumped for an easy dinner on a busy night, I know I can pull this together in under 30 minutes, and my family will gobble it up. Win-win, right? And while I know everyone has their own tweaked version of this, I thought I’d share my recipe with you. I know that most people probably grow up eating basic goulash rather frequently, but I had never had it until I was a teenager. Can you believe that? My sister Annie made it, and as with all things pasta, I fell in love. Pasta is my weakness, y’all… It’s seriously painful when I give it up. I don’t think Annie’s recipe is exactly the same… maybe she adds green peppers to hers? I’ll have to ask her. 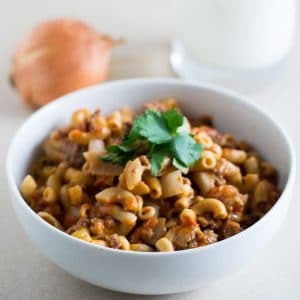 But anyway, the gist is definitely the same – tender macaroni, lots of ground beef, onions and tomatoes come together for this truly tasty and simple goulash recipe. 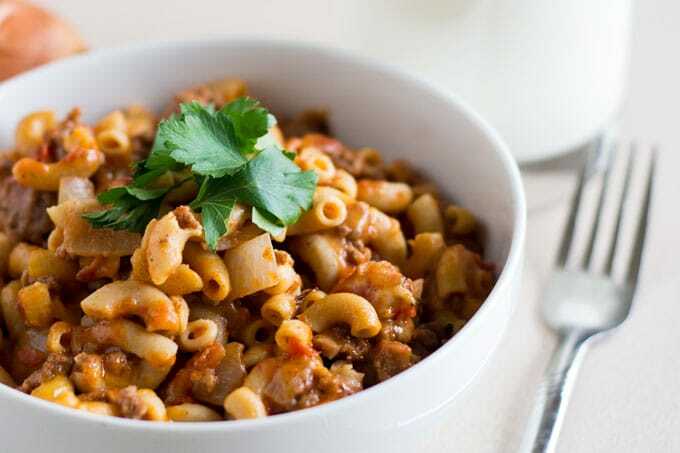 Doesn’t this quick goulash look delicious? While you can certainly use fresh tomatoes for this and shred your own cheese… I’m gonna be honest… I use cans of tomatoes and pre-shredded cheese. It just makes my life easier when we come home after a long day and are simply famished. That’s just what I look for in a 30 minute dinner. 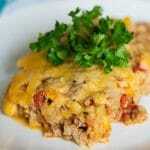 Quick dinner ideas are a must for busy moms! “Cheese in the goulash?” you might ask. Yes! Everything is better with cheese, in my opinion. 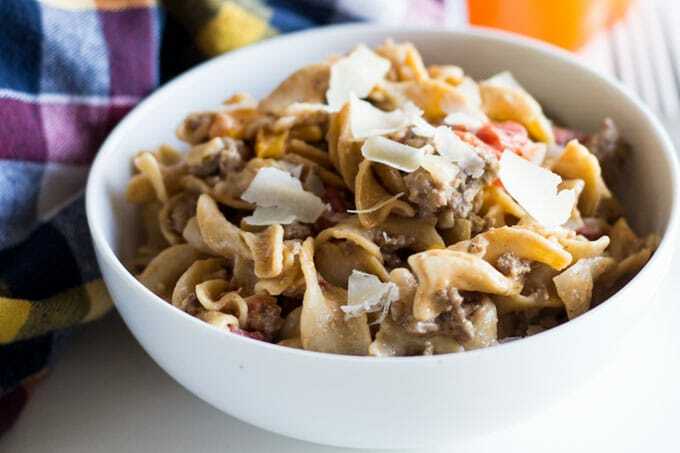 But if you want something that’s more similar to classic goulash, skip the cheese, and focus on pasta, beef, tomatoes and spices. Ready to make this meal yourself? Print out the recipe card below for exact measurements and directions for our simple goulash recipe. We hope you enjoy this easy 30 minute dinner! 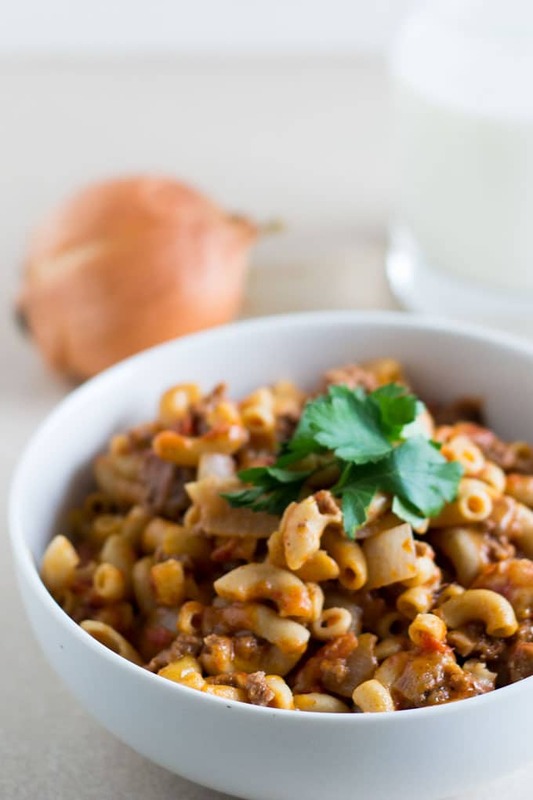 This simple goulash recipe is a little twist on the classic using convenient ingredients you already have in your cabinets as well as lots of cheese! Brown ground beef and onion together. While the ground beef is cooking, prepare macaroni according to package directions for al dente. Drain ground beef and macaroni. Return both to a single pan. Add spices, tomato sauce and tomatoes, and simmer for 5 minutes, or until heated through and bubbly. Stir in cheese, cover pan and let simmer until cheese is melted. 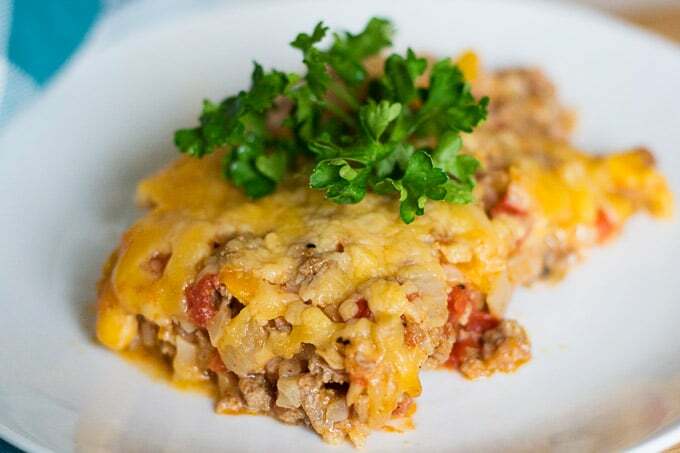 We’ve tried this easy recipe for goulash with cheddar, mozzarella and parmesan cheeses (or a mix of 2-3 of these), and all have turned out fabulous. It does, however, get pretty stringy with mozzarella. That’s not a problem for me, but the little guy gets frustrated with too much cheese, so I tend more towards the cheddar or parmesan side for us.